With most reviews written today for Pixar films, there is this innate drive to compare the studio’s latest with its fantastic catalog. The Pixar name has become synonymous with more than just great animated films – a story that is layered so that both children and adults can enjoy it, characters that you can relate to, smart and creative humor, beautiful visuals – over the last decade, Pixar has become a brand that brings in droves of people expecting another great film. The challenge that arises from that expectation is that instead of weighing the films on their own merits, they are endlessly compared to the films that came before. Brave arrives in theaters tomorrow with much hype about whether it makes for a film worthy of the Pixar name – Pixar film or not, Brave is first and foremost an impressive feature, with a compelling mother-daughter relationship that sits at its core. After the break, you can find my full spoiler-free thoughts on the film. At the outset of Brave, Merida has been told by her mother, Queen Elinor, and her father, King Fergus, that in accordance with their laws, the red-haired princess must submit to marry one of three suitors – the first-borns of the kingdom’s other three clans must compete for Merida’s hand. Merida, being the free spirit that she is, voices her strong reluctance, wanting to be free of her mother’s expectations so that she can decide her own fate. A rebellious teenager with a plan, she opts to show up her male suitors, which causes the Queen to be deeply embarrassed. A fight ensues between mother and daughter, and Merida resorts to her own means to try and control the situation. As the marketing for the film has done a remarkable job at keeping the rest of the story under wraps, I dare not say any more on the storyline. The relationship between Merida and her mother realistically unfolds before us – we are shown both perspectives with a fantastic scene, where the two parties speak their minds, but since they are unable to bring themselves to say it to the other, the scene cuts from one end of the “conversation” to the other. The dynamic feels intensely real, thanks to the script, the acting from Kelly Macdonald and Emma Thompson (who voice Merida and Elinor, respectively), and the gorgeous visuals that make you forget you are watching an animated film. You have either experienced or witnessed a relationship akin to the one that lies at the heart of Brave. The fact that you feel for both Merida and the Queen shows that Pixar spent a great deal of time polishing the story. It is easy for characters that stand in the way of the main character to become alienated and hated by the audience. It’s a natural phenomenon, as we want the protagonist to achieve his or her goal, and those who stand in his or her way are only preventing that character from meeting the goal. There is none of that here though, as we are also clued into the Queen’s viewpoint, which accomplishes the story trait that is so rare today in film and TV – the creation of characters that walk the line of complexity. While the above rings true, the male characters unfortunately take a step back (way back). Whether that decision was made to provide a greater focus on the women in the film, or to raise the amount of comedic relief in the story (or both), the King, Merida’s triplet brothers, the Lords, and the clan members are not given much else to do besides fight and party. The humor works sometimes, but at other times feels as if it is a distraction from the story. When the comedy does work, it is hilarious – the triplets have no lines, but their ongoing antics will have you laughing in your seat. Coupled with the on/off comedy, the pacing of the film is shaky, as the film’s short running time leaves you feeling that the time spent on the brawls between the Lords takes away from the precious time spent with Merida and the Queen. Their relationship is well developed, which naturally has you pining for more from them, rather than the comedy relief. Picking up in the the last act, the film moves at a breakneck pace, providing an intense ending. Before you know it, the film reaches its resolution, a deeply emotional one, that may bring tears to your eyes. Emotions run strong throughout the film’s story, thanks in great part to Merida’s character. She is strong-willed, stubborn, determined, impulsive – a teenager. With teenage years often being the most confusing for people, Merida’s difficult path quickly reminds us of some we have had to take. We may not have come across floating blue lights along our journey, but we have certainly been faced with others’ expectations and the challenge that comes from managing them when they conflict with our own. Merida is a complex character, well-written and relatable. Visually, the film is nothing short of brilliant. It is the prettiest animated film to date, with incredibly detailed characters and locales. Merida’s red hair is vibrant and moves so mind-blowingly well that you can’t take your eyes off her. The stunning landscapes of Scotland are recreated on-screen and will no doubt bring an influx of tourists to the country. Water has never looked better, specifically in one scene that features a large waterfall. 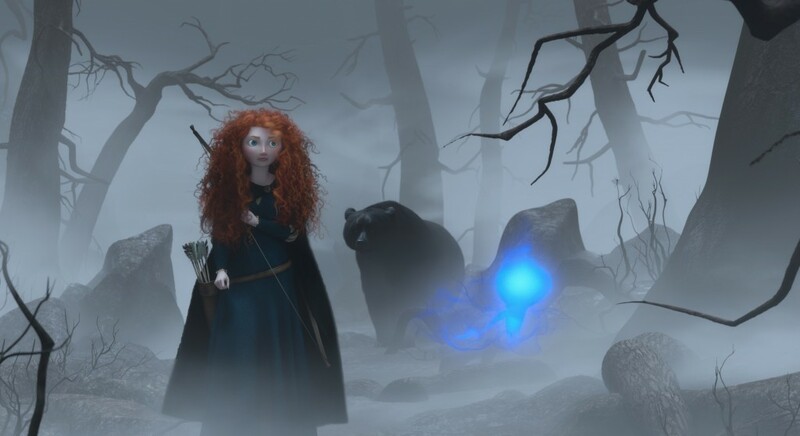 Additionally, another scene that has Merida trudging through the forest on a foggy day is breathtaking. On the musical side, composer Patrick Doyle has put together a worthy score for the film. While none of the arrangements are instantly hummable afterwards, they accompany the film’s story beautifully, enhancing the tension, the beauty, and the emotion, which any good score should do. Singer Julie Fowlis, who has a beautiful voice, provides two catchy songs to the film’s soundtrack, with “Touch The Sky” being particularly wonderful. Brenda Chapman, who is credited as co-director of the film, originally pitched the story, and was set to be the sole director, before she was replaced with Mark Andrews (also credited as a co-director). The two have delivered an admirable picture that may not be an instant classic, but rests upon engaging characters, easily making it one of the finest films of the year. And for those who just have to know how Brave stacks up to other films from the acclaimed studio, it is absolutely worthy of the Pixar name.